With our self managed Hosted PBX service we rely on you the user to configure your own Hosted PBX, ie, extension setup, call queues, ring groups, voicemail, etc. You have full unrestricted access to the web interface, including configuration and are free to change any setting, anytime you wish. Setup is free and we will configure you five extensions to be going on with. With our managed PBX service we do the work. You just tell us the way you want your Hosted PBX set up and we will configure it for you. You will still get access to the full Hosted PBX web interface but configuration options will be disabled. This is to prevent you making any accidental changes that could render your Hosted PBX inoperable. For a managed Hosted PBX we charge an inital setup fee of £25. Neither of the above two options are set in stone. If you fancy having a go yourself, feel free to choose the self managed option. If you then feel that its not for you, just ask us to change it. This may mean we have to reset to default and start from scratch in some cases. If we are managing your Hosted PBX, you can just ask us and take full control at any time. For our up to 10 user service we use the excellent 4PSA Voipnow Professional product. Documentation can be found in our download area. 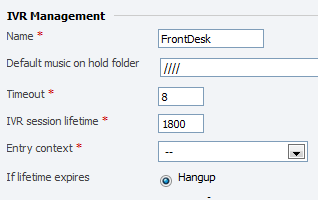 Choose the client user from the dropdown field. 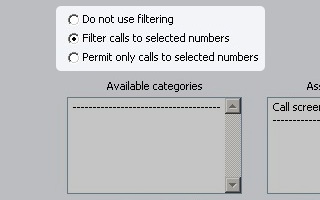 Please ignore any references to charge plans, we have this switched off by default as we use a separate billing system. If you are interested in a greater number of users that 10, please either drop us an email at support@directvoip.co.uk, call us on 0161 710 2180 with your requirements or pop on to our Live Support for a chat. Our Dedicated PBX Servers start from as little as £25 per month or as much as £500+. One of our advisors will be happy to go over your options with you. 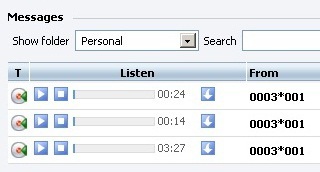 Voicemail intercepts calls and records messages left by your callers. 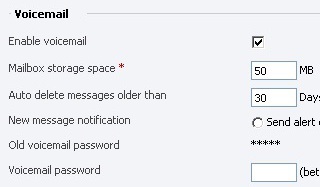 You can check all recorded messages even if you're out of office. Of course, you can also have them sent to you by email also. No one likes to miss important phone calls. 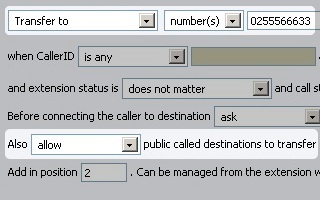 Using Call Forward you can forward calls to another extension of the system, or to any other phone such as your mobile. Therefore, even if you're not at your desk, you will still remain available. Never miss a call, regardless of your location. When a caller dials your number, your mobile phone, home phone and office phone will all ring at the same time. The call will be put through the line that you create, ensuring that you can be easily reached even when out of office. The IVR feature can assist you in creating complex auto-attendant voice menus that can be used in multiple contexts, with various options and actions. You can even integrate it with your applications using the simple REST based CallAPI! Call screening is a feature particularly interesting for call centers, but also for other organizations such as banks or insurance. Such companies can filter calls by destination, comply with local regulations, and improve customer satisfaction. 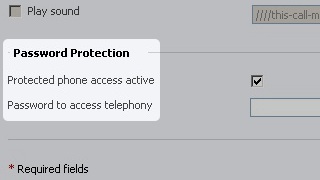 This feature improves privacy protection, automates tasks, and enhances user productivity. 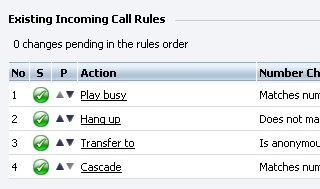 You can filter incoming calls according to CallerID and time of call and by means of rules that trigger a set of predefined actions, such as call hang-up or transfer to specific phone numbers. VoipNow provides two call recording options: event-driven - in this case, employees need to press a button for the recording to start; or unconditional call recordings - the management sets up recording to trigger automatically. The features listed above are just a subset of those available with our extremely powerful Hosted PBX. Full documentation is available in our download area.